Additional Info: Garlic belongs to the family where chives and onion are registered. California is the place where garlic is most widely cultivated. The bulb is applied in herbal medicine. Elements Applied: The oil and bulb are applied in herbal medicine. Active Components: Allicin, a sulfur component, which is excreted when fresh garlic is chopped, gives origin to other sulfur components: vinyldithiins, allyl sulfides, and ajoene. History: Garlic was so popular that it was even described in the Talmud and the Bible. Dioscorides, Pliny the Elder, Galen, and Hippocrates prescribed garlic for a wide range of conditions, like bacterial infections, respiratory diseases, indigestion, and weakness. It has also been used since time immemorial in Chinese medicine. Garlic’s antimicrobial effect was proven by Louis Pasteur in 1858. Used For: The plant is known to boost metabolic rates, kill helminthes, treat bacterial infections, relieve spasms, boost sexual desire, relieve flatulence, cleanse the body, promote urination and menstruation, induce expectoration, act as an irritant, rejuvenate the body, and resolve boils. The range of conditions, in which garlic is employed includes: indigestion, impotence, immunity disorders, hysteria, hypertriglyceridemia, elevated arterial tension, high cholesterol, hemorrhoids, heart conditions, edema, coughs, convulsions, congestive heart failure, colic, influenza and colds, lymphatic inflammations, atherosclerosis, asthma, yeast infection, round worms, tumors, tremor, tuberculosis, skin conditions, rheumatism, chronic ear infections, paralysis, bone tissue and nerve recovery, intermittent claudication. Garlic’s positive effect on the cardiovascular system is proven by over 250 scientific sources. It is potent of decreasing triglyceride and cholesterol quantity in blood, decrease platelet accumulation, and enhance fibrinolysis, which leads to slower blood clotting. The plant is characterized by antioxidant capacity and is able to reduce blood pressure. Still, one should remember that garlic can’t substitute medical remedies intended for slower blood coagulation, it works only to prevent quick clotting. Garlic is also capable of reducing fungal, bacterial and viral infections. It is effective in eliminating several types of bowel helminthes. However, its strength is neutralizing certain bacterial infections is really lower than that of penicillin. Thus, it should not be used as an alternative for antibacterial remedies, but can only be applied as an aid against bacterial conditions. 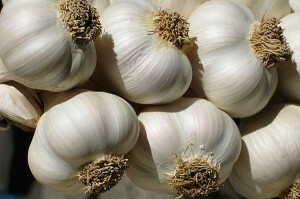 Garlic can decrease Candida albicans distribution, as well as produce a prolonged effect on chronic yeast infections. Researches conducted on individuals revealed that consuming garlic on a daily basis helps decrease the possibility of colon, stomach, and esophageal cancer. This garlic’s capacity likely originates from the decrease in carcinogenic component production when eating the plant. Researches on animals also state that garlic, particularly its sulfur components, decreases cancer distribution, especially when it comes to skin and breast tumors. Garlic is most commonly applied to sores, wounds, and indolent tumors. Bulb poultice is applied to relieve ringworm and scrofulous ulcers. Garlic clove inserted into the ear is highly beneficial for ear pains. As a topical remedy the plant is used for neuralgic pains, paralysis, and sciatica. Unprocessed garlic juice is used as an inhalant for lung tuberculosis and severe coughs. The oil, used to roast garlic, is thought to be beneficial for nervous conditions, like scabies, convulsions in infants, as well as rheumatic pains. Garlic is considered beneficial for dilated bronchi, lung gangrene, severe coughs, pulmonary phthisis, dropsies, agues, nervous conditions, flatulence, coughs, and fevers. Garlic decoction produced on milk or water is applied in sciatica, flatulence, and hysteria. Garlic syrup is beneficial for chest and lung disorders, hoarseness, and asthma. Garlic oil is applied to treat rheumatic and paralytic conditions. Preparation and Intake: Some individuals find it helpful to eat a garlic clove a day. People who feel its odor unpleasant, may use coated pills or capsules, standardized to allicin content, at a dose of 400-500 mg one or two times a day (which should sum up to 5,000 mcg of allicin). In form of tincture the herb can be applied at a dose of 2-4 ml thrice per day. Safety: The majority of people like garlic. Still, in some patients, it can cause flatulence or heartburn, especially when it comes to elevated sensitivity. Due to garlic’s capacity to reduce coagulation, people using anti-clotting medicines, should speak to their health-care practitioner before using the herb. People, who are planning to undergo a surgical procedure, should let their surgeon known if garlic supplement is used. Garlic can be safely applied by pregnant or breastfeeding women.